Every home is different. Each project has custom woodworking design needs. Individual homeowners have their own home design aesthetic. Sometimes pre-fabricated cabinetry from the big box store just won’t fit the unique size and taste of your home design for your renovation or new construction. That’s why Jeff, the owner at Baumann Custom Woodworking, cultivates a direct relationship with clients to provide individualized service on each project. He works diligently throughout the design, fabrication, and installation process to provide high-quality service to homeowners, builders, and developers throughout Central New Jersey and Bucks County, Pennsylvania. Jeff crafts unique cabinetry to your specifications. Contact us today for an individualized service quote. Baumann Custom Woodworking offers unique products for home builders, developers, and homeowners. Based in Hunterdon County, New Jersey, our company produces cabinetry components that are crafted, start to finish, in-house. Our craftsman believes in hard work, attention to detail, and keeping promises. Accuracy and precision are paramount to the operation. Our company strives to provide high-quality custom woodworking design at competitive prices. In 1999, Jeff started fine woodworking and cabinet construction as a hobby. The next year, he started working for a builder, where he contributed to all aspects of the daily operations. Jeff works on new homes as well as additions and renovations. He often constructed cabinets for these projects. In 2009, Jeff became a full time woodworker. Clients work directly with the owner through the entire design, fabrication, and installation process. Jeff works with developers and builders on new construction projects, renovations, and additions that require new cabinetry. He also crafts custom kitchen and bathroom cabinets for Central New Jersey and Bucks County Pennsylvanian homeowners. 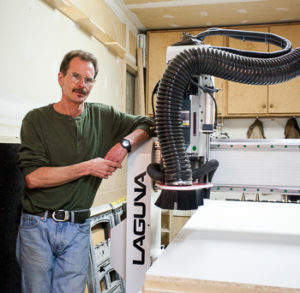 As a craftsman, he takes pride in each custom woodworking project. Jeff will gladly discuss your upcoming woodworking needs. Contact us for a quote.